Drainage is always an issue for homeowners who want to incorporate natural solutions to landscaping problems. Finding a natural way to allow for drainage but still maintain the ecology of your yard can be challenging. JCMS Gardening gives you options for natural drainage solutions that will keep your driveway and yard free of standing water but still adhere to your desire for a natural yard. Draining water is very important if you want to maintain your driveway, walkways and other structures as well as your plantings and lawn. Standing water can create mold problems, harbor insects and cause other issues with your outdoor landscaping. It is important that you find a way to drain your yard quickly but comply with the natural contours of your landscape whenever possible. Slope. If your driveway slopes down naturally, you are actually in luck when it comes to drainage. It is likely that you will not have much to worry about because water tends to run downhill and slope encourages natural drainage. The more sloped your driveway is, the easier it will be to avoid standing water problems. Swales. A swale is a shallow, wide depression on the side of the driveway that encourages draining. By constructing swales around driveways or walkways, you can encourage water to flow where you want it, making it simpler to avoid a standing water issue. For extra fun, you can landscape your swales to resemble small creeks or fill them with plants that will benefit from a great deal of water. Drains. For serious standing water problems, a drain may be the answer. 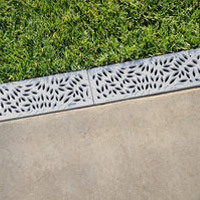 Drains can be incorporated throughout the driveway’s construction and can be designed to be beautiful parts of the whole visual rather than ugly metal grids. These drains, in turn, can lead to a downflow to water another set of plants or supply water to a small water feature. Porous pavement. You can choose paving materials that are porous to allow water to seep through. This can put the moisture back where it is needed–in the soil–without creating problems with your landscaping or puddles in your driveway. Juniper Landscape Company is ready to work with you to create the perfect, natural solutions to all your draining needs throughout your landscape.